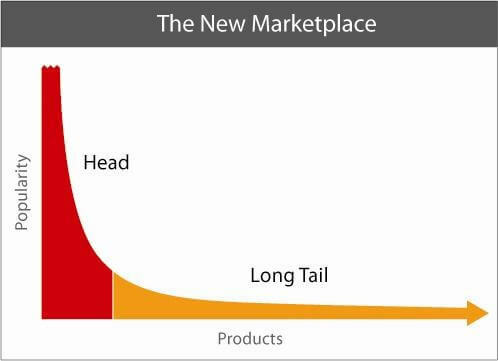 Let’s go over the concept of long tail and understand what it actually is. The concept was first applied to human behavior by George Kingsley Zipf, professor of linguistics at Harvard. Zipf’s law states that if a collection of items is ranked by popularity the second item will have around half the popularity of the first one and the third item will have about a third of the of the popularity of the first one and so on. Nowadays, this concept is used to mainly describe niche marketing and the way it operates online. Let’s try and see how online retailers can benefit from this concept. As a rule long tail marketing puts an accent on less popular products, developing a business sales model based upon products in the “long tail.” It is more about inventory management than product promotion. Provision of a greater variety of inventory gives businesses a chance to reach more customers and generate more sales with no extra costs. Long tail marketing is most effectively employed by online retailers such as Amazon, due to the supply-side considerations of managing such an inventory. A brick-and-mortar bookstore only has a limited shelf space available, and must devote the biggest part of its shelf space to most popular and demanded products. Less popular items compete with each other for limited space, and of course greater variety increases costs in stocking. The Internet changes that. It allows people to find less popular items and subjects. It turns out that there’s profit in less popular products as well. For instance, Amazon stocks items in warehouses, while displaying them on its website. This surely results in a much lower cost for shelf maintenance. Web-page maintenance has its costs, but they are substantially lower than physically sorting, stocking, and maintaining shelves.